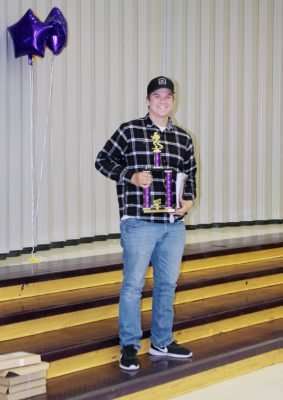 After a rough season, the Lassen High School varsity football Grizzlies finished their time together as a team with an awards ceremony held in the student center at Lassen High Wednesday, Dec. 6. Head coach Tom St. Jacques opened the evening with a review of the season. With an overall season record of 4-6, St. Jacques expressed his disappointment and spoke of his hope that the 2018 team will work hard to keep history from repeating itself. St. Jacques confirmed that the season was definitely full of obstacles. Regarding the meningitis outbreak that occurred late-September and early-October, St. Jacques could only shake his head as the friends and family present at the awards event laughed. St. Jacques later motivated the boys about the importance of a positive attitude when feeling under the weather during football season. He stated, “Illness is 90 percent mental,” and assured the boys they could push through anything with enough determination. 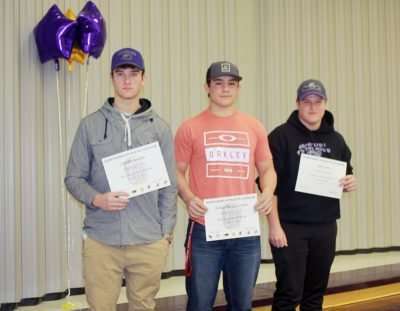 First to be honored were the three individuals who earned and maintained a 4.0 grade point average throughout the football season: Dyllan Bond, Finn Osborn and Steven Cagle. 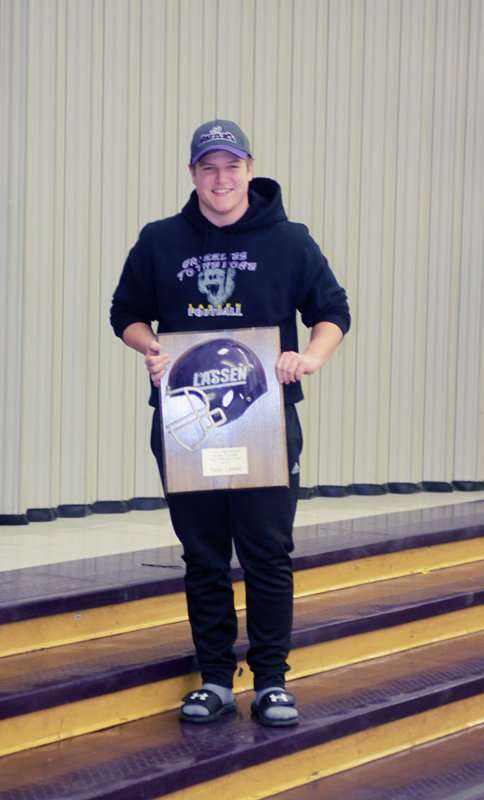 St. Jacques praised the three athletes who were effectively able to keep their performance in class just as stellar as their performance on the field. However, St. Jacques also utilized the opportunity to address the importance of academics and the need for scholastic improvement within the Grizzly football community. “If you’ve got a lot of smart kids, you have a really good team. You say things once and they get it,” said St. Jacques. The head coach also mentioned sports should not affect grades, as football doesn’t take much time out of the boys’ daily lives. With this in mind, he expressed his hope that the 2018 team might aspire to be like the 2016 team, which had eight individuals who earned a 4.0. 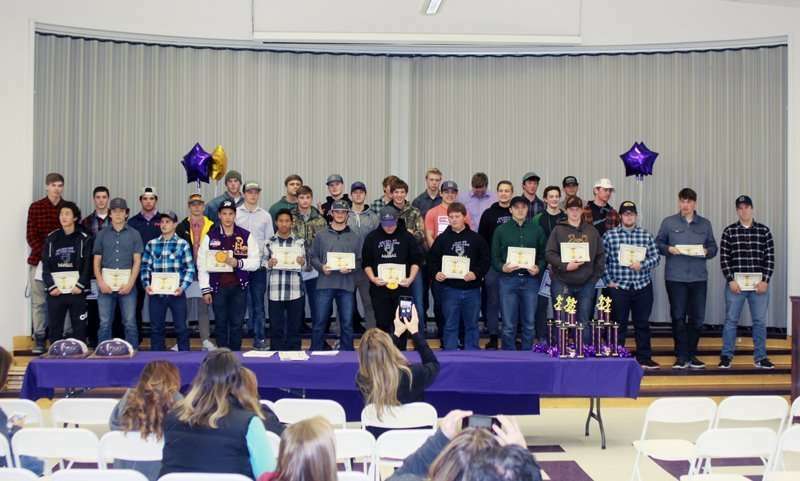 Once academic achievement was recognized, it was time to move on to honoring each member of the 2017 varsity football team individually. St. Jacques started with the juniors before introducing the 13 seniors who were present at the event. With each student athlete, St. Jacques had quite a bit to say. While the head coach pointed out some of the best qualities of the individual players, he also insured that the boys remain humble by shining a spotlight on some of the flaws within each player. St. Jacques made sure to keep the mood of the evening from being too serious by acknowledging each student who didn’t attend summer practice, avoided the weight room or didn’t quite live up to his potential on the field. With a few laughs shared alongside the comments, St. Jacques definitely took advantage of his final opportunity to drill in some life lessons to each Grizzly while on a one-to-one level. 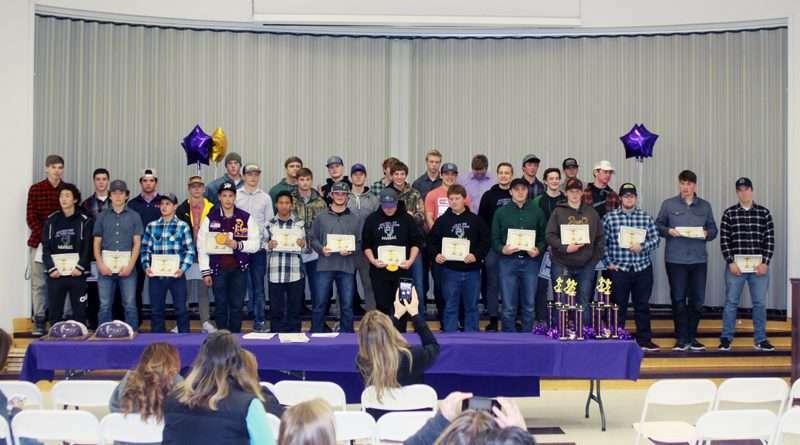 While the event was mainly used to honor the 2017 players, it was also a grand opportunity for the 2018 varsity team to understand what their coach expects from them. “If you’re going to play, you’ve got to commit,” said St. Jacques. Once each player was individually recognized by St. Jacques, the evening continued on to present the well-deserved awards. Unfortunately, the awards table was barer than previous years, according to St. Jacques. 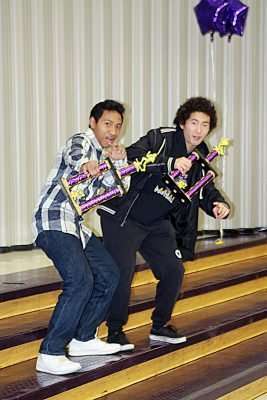 “Sometimes we have this table full of trophies, but this year we didn’t have as good of a year,” he said. 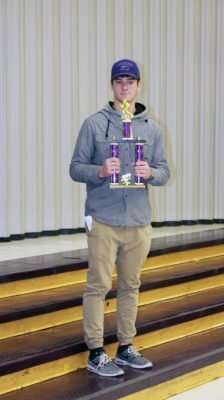 Senior player Jeremiah Chaffee earned the Most Improved Player Award. 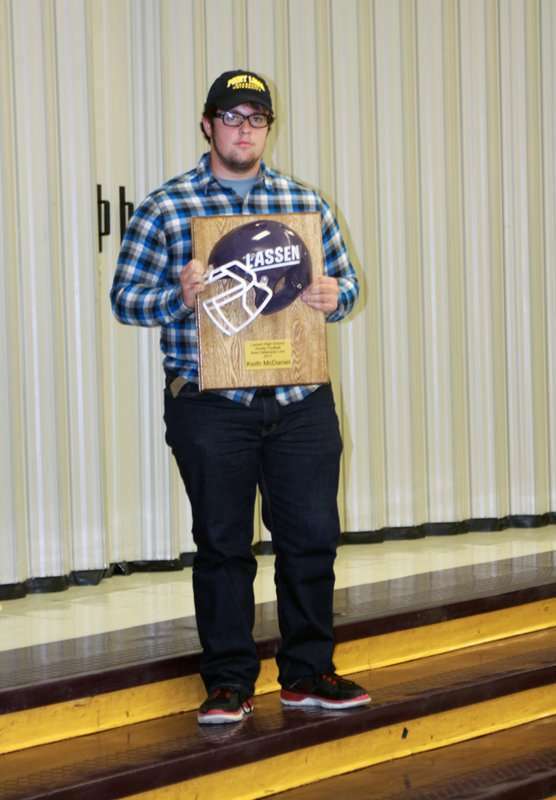 Junior Chandler Monahan was awarded Offensive MVP. “This is the first time we’ve ever had a receiver at Lassen High School who had 1,000 yards receiving. With that last game, he got up to the 1,000-yard mark, and that’s with the other teams always focusing on him,” said assistant varsity coach Paul Moore. 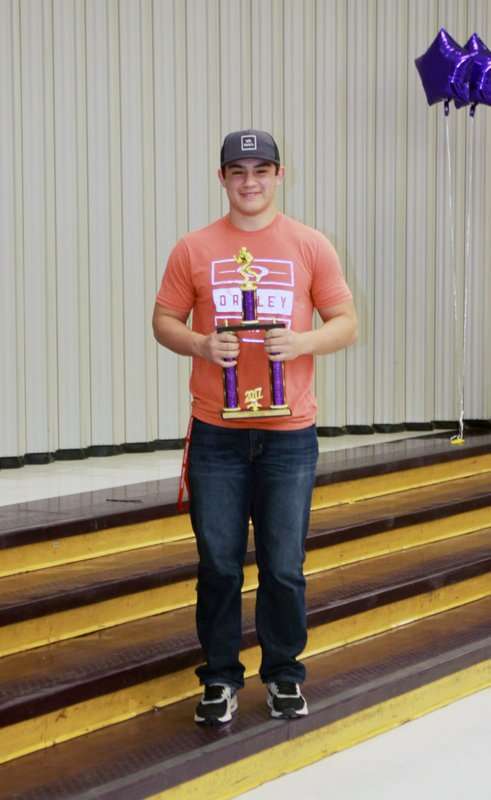 Defensive MVP was awarded to junior player Tucker St. Andre. St. Jacques said, “We had a tough defensive season, I’ll be honest. We didn’t stop people like we wanted to; we thought we could have done a little better job. But, with the injuries we had, it is what it is. Next up were the Coach’s Awards presented by St. Jacques. “You’re going to have kids who just enjoy the game. They do not have the size, they don’t have any of the attributes that colleges are looking for; they just enjoy the game. They love playing. They love practicing. They go out there with excitement. You love that as a coach,” said St. Jacques. The two recipients of the Coach’s Awards were Xyler Elias and Nick Molina. Assistant varsity coach Jason McMullen presented the Best Offensive Lineman Award and the Best Defensive Lineman Award. Tyler Lewis was awarded Best Offensive Lineman. The recipient of the Best Defensive Lineman Award was Keith McDaniel. “(McDaniel) has always done his best to be stronger than his old coach. One of the best things about Keith is he’s been a kid who I can give the basic runaround and then I don’t really have to watch him during the game. It’s been a real joy to coach him. It feels like I’ve had Keith forever. He’s a great kid, great help. I hope a lot of success for him in the future,” said McMullen. The final awards of the night were voted on by the coaches of the Northern Athletic League. St. Jacques took a moment to explain how the All-League nominations worked, as each coach is allowed a limited number of nominations based on the final ranking of the team post-season. Since Lassen finished league play with a 2-3 record, only three individuals from the Grizzly team were recognized by the League. “This should serve as a motivational tool for the juniors. The better you do next year, the more All-League awards we’ll have,” said St. Jacques. Monahan and St. Andre were both named to the All-League team, and Lewis was awarded honorable mention. The many words of support shared by the Lassen High varsity football coaches for the team as well as for the individual players will definitely be used as a strong foundation to spark improvement for those who return for the 2018 season. Grizzly fans can rest assured that the purple and gold boys will return to the field refreshed and ready to work hard by August 2018.